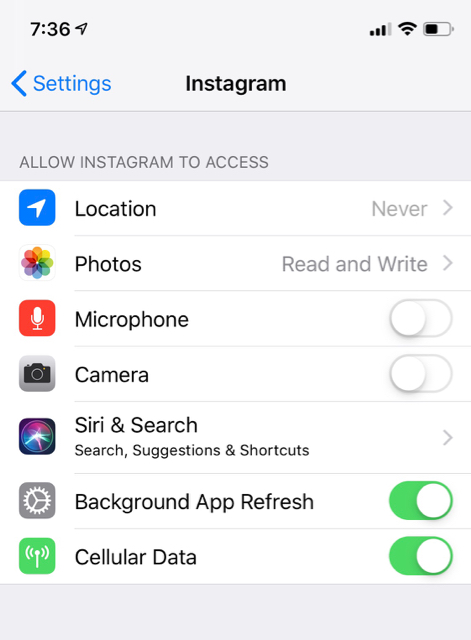 How to get rid of Instagram notifications? For some reason I keep getting Instagram notifications, even though I deleted the app from my watch, and also under 'notifications' in the watch iOS-app, Instagram is switched off. - But I'm still getting notifications... how to turn notifications off, of an app that already is turned off?? I wish I had an answer for you. I've been doing some sleuthing, and the only thing I can think of is to turn off your Instagram notifications on your iPhone, because most likely, you've got your watch set up to mirror your iPhone. I realize that is not really helpful, or ideal for you, so perhaps consulting Apple Support might be a good option. Please keep us posted! Install Instagram on your Watch, disable it under Notifications in the Watch app on your iPhone and delete the app again. 1) for some reason when I switch push Instagram (within the app that is) notifications on my iPhone OFF, they pop back on. Re-installing the app doesn't solve anything, goes it's a bug in the app? 2) I can't find the Instagram app in the Watch-store... only a few Chinese apps show up. In the notifications section, Instagram notifications are switched OFF, but indeed they might get mirrored via my iPhone (which doesn't allow me to switch OFF notifications through the app). • I guess to stop Instagram notifications on my Watch, I need to stop notifications through the iOS menu. Which I don't want to do, since I still want to get notifications on my iPhone. Geeeeezz, why is Instagram such a ****??? Have you considered to have the notifications get delivered quietly? Swipe the notification left and tap manage to set to deliver quietly. That will make it stop lighting up your screen and make a sound. Yet you will see the notifications when you swipe down to check for notifications. Yes I have... but I don't want to switch off the basic notification settings on iOS, only because my Watch doesn't want to cooperate individually. I know what you mean. I feel the same way. I remember this happening to me before but I can’t for the life of me remember anymore how I fixed it. Boy, that’s funny. Instagram doesn’t even offer notifications on my iPhone. It’s also not listed in settings/notifications or on the watch app at all. Facebook, for being one of the largest tech companies out there, sure is pretty lacking on making good software. It’s like they’re willingly crippling their apps on iOS. @doogald you don’t see options for notifications because when you installed the app, you dismissed the prompt about notifications. A reinstall of the app should fix that. Oh, I definitely don't want them. It's just curious because this is the first iOS app I've ever seen that doesn't somehow expose the ability to turn on notifications if you have them off. Nintendo's NES controllers are now available to preorder!